Frequent food scandals in China in recent years such as "cadmium rice" and "poisonous beans" have caused public outrage. In response, voices calling for the development of ecological agriculture (by which I mean to minimise the use of chemical fertilisers and maximise the use of local knowledge and resources) have swelled. 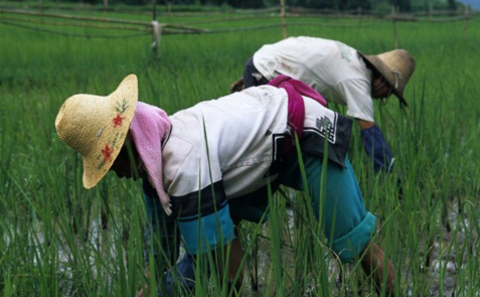 But the very question - can ecological agriculture feed China? - is in fact highly problematic. First, what is "feeding China" actually supposed to mean? According to data from the United Nations Food and Agriculture Organisation, the world produces enough food to cover the world population's needs - yet nearly 900 million people still go hungry every day. China alone is home to 130 million people experiencing malnutrition, mostly in remote rural areas, while nearly a fourth of the urban population is obese. Thus food security does not solely depend on food production, but also on distribution – which is to say accessibility. It is erroneous to believe that sufficient food production automatically eradicates malnutrition as long as China's poor continue to have much worse access to the stuff than the rich. Second, food waste remains a serious problem. According to estimates from the United Nations Environment Programne, one-third of the world's food production gets wasted during storage, transportation and consumption. Experts from China Agricultural University found that around eight million tonnes of protein and three million tons of fat go to waste from the nation's dinner tables alone - enough to feed 200 million people for a year. In this light, China's current level of food production is more than sufficient. For example, a global survey of 18,870 rice farmers in 13 countries shows that a traditional growing method known as "System of Roots Intensification (SRI)" (which relies on tillage, density reduction, soil fertility enhancement etc.) can yield 20-100% more rice while reducing fertilisers by 50-100%, seed demand by 80-90% and water demand by 25-50%. A case study on Xinsheng Village in Sichuan province reveals that SRI increased rice yield by 42% compared to conventional farming and that many farmers found SRI to be less labour-intensive. A study on 62 ‘ecological operations’ from around the world concluded that fewer pesticides were used in 75% of the cases (by an average of 70.8%) while output increased across the board (by an average of 41.6%). Ecological agriculture has already proven successful in some of the world's agricultural powerhouses. The combined wheat production of France, Germany and the UK accounts for one-third of Europe's total. 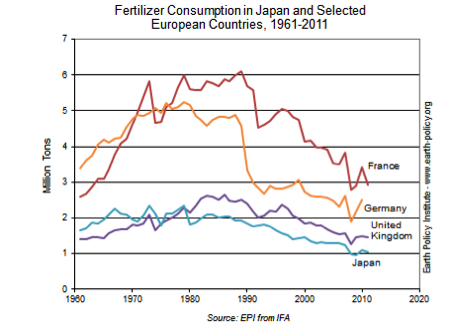 High yields have been maintained despite a decline in the use of fertilisers over the past 20 years (see below). Research has previously shown that European farms that implement the strictest ecological standards at first obtain yields 8% smaller than those of conventional farms. Yet after a transition period production picks up and eventually meets, or even exceeds, yield levels achieved by conventional agriculture. Were China to implement ecological agriculture and aim to use fewer chemical inputs step by step in different areas, the slightly lower yields of the areas in transition could be offset by increases in other areas not yet converted, so overall there will be no major fluctuations of output. And if food waste were to decrease as well by even as little as 10%, then ecological agriculture could indeed "feed China". Organic farms do not achieve less output. The labour-intensive nature of ecological agriculture is, potentially, not an impediment either as it provides employment opportunities to rural jobseekers. Furthermore, organic farming technology is constantly improving. Ecological agriculture's real disadvantage is its weak position in an imbalanced discourse and the uneven distribution of benefits. The benefits are anchored in the State Council's Notice, 'Reform on Deepening the Fertiliser Distribution System,' which outlines a series of preferential treatments for fertiliser companies. China subsidises the fertiliser industry with nearly 110 billion RMB a year, nearly as much as the central government spends each year on education. The original intention behind the subsidies was to lower the price of fertilisers, thereby keeping farmers’ production costs low. But the "Notice" also liberalised the fertiliser business and so the market now determines the price. The proportion of farmers' spending on fertilisers has constantly increased vis-a-vis their production costs and just a quick glance into the fat books of the companies tells us all about the whereabouts of the money. Organic farms, in contrast, receive zero support. Greenpeace finds that the government has launched no concrete project related to ecological agriculture and only spent a total of 7 million RMB on related research in 2011. Rather than asking whether ecological agriculture can feed China we should be asking whether ecological agriculture would also feed the chain of vested interests in today's conventional agriculture.